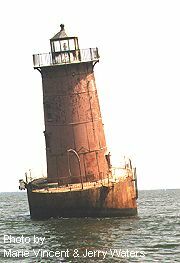 Sharps Island Lighthouse – Chesapeake Chapter U.S.L.H.S. The Sharps Island lighthouse is a cast iron caisson filled with concrete with a brick lined cast iron tower built on top. The tower is 37 feet tall which sets the light 54 feet above the mean water level. This structure was constructed in 1881-2 and first lit on February 1, 1882. This is the third light at this site. The first was a simple wooden house with a lantern room on top that held the lamp and reflectors. This house was set up to be movable so that it could be pulled back from the receding shore line. The house was sited on five acres of land on the 900 acre island. By 1865 the water had reached a corner of the building and the five acres were gone and the entire size of the island was down to 450 acres. It was decided to build a screw pile lighthouse and to place it at the tip of the shoals that extended from the tip of the island. This structure was completed late in 1865. This light lasted until February 10, 1881 when during a winter thaw of the bay, the wind driven ice over ran and swept the building from the screw piles and carried it five miles down the bay with the keepers still inside. The house finally ran aground and the keepers were able to escape. Congress approved $35,000 for the new current caisson light in 1881 and it was erected during that summer and fall. The tilt of this light is unique although not unexpected considering it’s exposed location. During the winter of 1976-7 large ice flows, some piling up on the flats to heights of 40 feet, pushed against the tower and tipped it to the south at about a 15 degree angle. There are questions as to what will happen if we get ice flows on the bay like this again. Will we lose this light?